Sewage Treatment – For recycling of waste water, use of biosolids and to generate renewable energy for cleaner, safer and greener environment: | PARTHA DAS SHARMA's Weblog on "Keeping World Environment Safer and Greener"
Introduction – In urban areas sewage is created by residences, institutions, hospitals and commercial and industrial establishments. 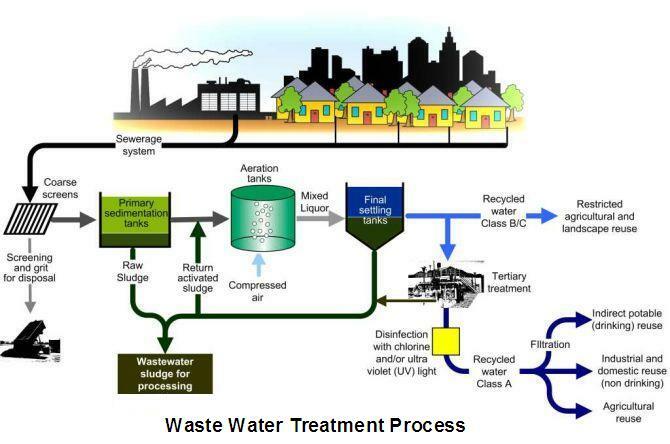 Sewage treatment and disposal system is an important function for any city planner, in order to recycle the used water. It is the ultimate return of used water to the environment. Discharge to the environment must be accomplished without transmitting diseases, endangering aquatic organisms, impairing the soil. Sewage treatment is an artificial process to which sewage is subjected in order to remove or alter its objectionable constituents and to render it less dangerous from the standpoint of public health. Wastewater is treated to remove contaminants or pollutants that affect water quality. The treated wastewater is recycled / reused for gardening, irrigation, flushing etc. Disposal system has arrangements to distribute the used water either to aquatic bodies such as oceans, rivers, lakes, ponds, or lagoons or to land by absorption systems, groundwater recharge, and irrigation. Waste water must be mixed, diluted and absorbed before it is discharged to the general body of water, so that the receiving environments do not lose its beneficial usable characteristics; such as drinking, bathing, recreation, aquaculture, irrigation, groundwater recharge, industry etc. Water quality standards relate to the esthetics and use of the receiving environment for public water supply, recreation, maintenance of aquatic life and wildlife, or agriculture. The parameters of water quality, which define the physical, chemical, and biological limits, include floating and settleable solids, turbidity, color, temperature, pH, dissolved oxygen, biochemical oxygen demand (BOD), toxic materials, heavy metals, and nutrients. Sewage can be treated close to where it is created (in septic tanks, bio-filters or aerobic treatment systems), or may be collected and transported via a network of pipes and pump stations to a municipal treatment plant. Sewage treatment, as mentioned earlier, is the physical, chemical and biological processes used to clean industrial and domestic wastewater and has improved significantly over the past 20 years. However, the energy requirement to treat sewage to the highest standard has been quite large. Further tightening of water quality standards, especially in developed nations; suggest energy costs will increase substantially in future. We will discuss here about possibility of renewable energy generation from sewage, to offset the extra energy requirement for sewage treatment and also to use surplus energy for domestic purpose. In fact, the actual energy used will depend on the quality of sewage and intensity of treatment required. (a) Primary – Broadly, solids are physically settled out. Primary sewage treatment removes larger floating objects through screening and sedimentation. The incoming wastewater flows through one or more screens and then enters a grit chamber where it slows down enough to allow sand, gravel, and other inorganic matter to settle out. In treatment plants where only primary treatment occurs, the effluent is chlorinated and discharged into circulation in a water source. The sludge, or sedimentation of larger solids, is removed, dried, and disposed of. Primary treatment removes 50 to 65 percent of suspended solids and decreases biological oxygen demand (BOD) by 25 to 40 percent. Primary treatment alone is not considered adequate for protection of the environment or people’s health. (b) Secondary – Bacteria convert organic matter to a carbon-rich sludge. Secondary treatment relates to processes similar to natural biological decomposition. Aerobic bacteria and other microorganisms are used to break down organic materials into inorganic carbon dioxide, water, and minerals. Trickling filters, which are made from a bed of rocks with a microbial covering, are used to absorb the organic material present in the water. Activated sludge processes can be used in place of trickling filters. The level of suspended solids and BOD in wastewater after primary and secondary treatment has been decreased by 90 to 95 percent. This level of treatment is not effective in removing viruses, heavy metals, dissolved minerals, or certain chemicals. (c) Tertiary (advanced treatment)– Further treatment may be used to remove more organic matter and/or disinfect the water. Tertiary treatment is an advanced level of treatment. This form of treatment can decrease the level of suspended solids and BOD to approximately 1 percent of what was present in the raw sewage prior to primary treatment. Advanced treatment processes consist of several biological, chemical or physical mechanisms. Sewage treatment aims to destroy pathogenic organisms. Since primary and secondary treatments do not destroy a significant number of organisms, chlorination, which is effective in killing bacteria, is used to disinfect treated effluent. Before the final effluent is released into the receiving waters, it may be disinfected to reduce the disease-causing microorganisms that remain in it. The most common processes use chlorine gas or a chlorine-based disinfectant such as sodium hypochlorite. To avoid excess chlorine escaping to the environment, the effluent may be dechlorinated prior to discharge. Most advanced wastewater treatment systems include de-nitrification and ammonia stripping, carbon adsorption of trace organics, and chemical precipitation. Evaporation, distillation, electro-dialysis, ultra-filtration, reverse osmosis, freeze drying, freeze-thaw, floatation, and land application, with particular emphasis on the increased use of natural and constructed wetlands, are being studied and utilized as methods for advanced wastewater treatment to improve the quality of the treated discharge to reduce unwanted effects on the receiving environment. Other disinfection options include ultraviolet light and ozone. The effluent is generally discharged to fresh, ground or coastal water. Sludge is applied to agricultural land, incinerated, used for land reclamation or used for other purposes, such as composting or landfill etc. (a) Choosing low-energy treatment options, if possible. However, local constraints may limit choice. (b) Replacing machine parts, such as pumps and motors, with more efficient versions. (c) Optimizing processes using sensor technology. For example, pumping can be adjusted according to flow. (d) Reusing water. “Greywater” from bathing, laundry and washing dishes can be reused to flush WCs. This may provide savings of around a third of daily household water demand. C. Biosolids – Biosolids are treated sewage sludges. Sewage sludge is the solids that are collected from the wastewater treatment process but which have not undergone further treatment. Sludge normally contains up to around 3 % solids. Biosolids are a product of the sewage sludge once it has undergone further treatment to reduce disease causing pathogens and volatile organic matter significantly, producing a stabilised product suitable for beneficial use. Biosolids, normally contain between 15 % to 90 % solids. Biosolids are carefully treated and monitored and they must be used in accordance with regulatory requirements. D. Energy generation – There are mature, widely-practiced technologies for generating fuels from sewage treatment. Moreover, research has identified future methods for exploiting sewage as an energy resource as well. (a) Sludge Incineration – Most of the sewage sludge produced at sewage treatment plant is applied to agricultural land as a soil conditioner, reducing the need for fertilizer. Sludge may also be incinerated, with the option of energy recovery. However, to incinerate sludge, it must be dry enough to burn with no extra energy input other than that needed to fire up the incinerator. It therefore needs dewatering, using energy intensive processes such as centrifugation or thermal dehydration. Centrifugation requires less energy but surplus heat from incineration that can be used for thermal dehydration. There has been strong opposition from some sections of the public over incineration of wastes due to fears about impacts on human health. At present, reuse of sludge via application to land is generally considered a more acceptable option. 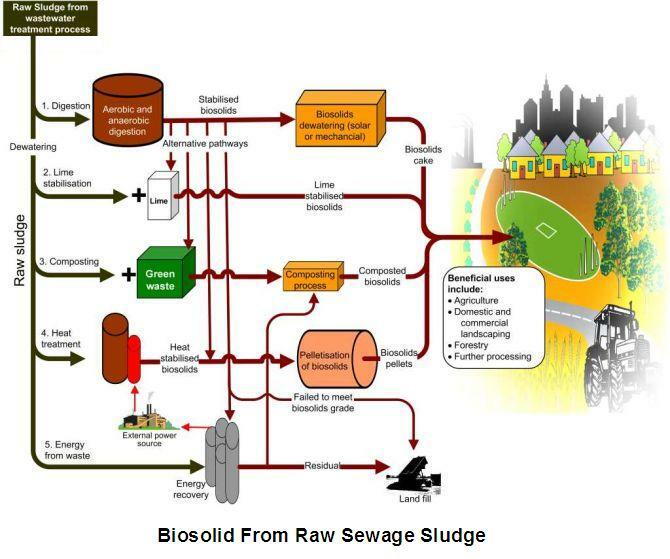 (b) Biogas – Biogas production from sewage sludge treatment, via a process called anaerobic digestion, is already a well established means of generating energy in many developed countries. Bacteria used to organic matter in sludge to produce a mixture of methane (CH4 of 60 – 65%), carbon dioxide (CO2 of 35 – 40%) and trace gases. Impurities, such as hydrogen sulfide and water, are removed and the resulting biogas is then commonly used in boilers or combined heat and power systems. Biogas may also be used for other applications, such as vehicle fuel, if CO2 is also removed. Anaerobic digestion also reduces the solids content of sludge by up to 30%, reducing the energy costs involved in its transport. 2. Future Technologies for Energy Production – There are several novel technologies that produce energy or fuel as a by-product of sewage treatment, although further work is needed to improve performance, reliability and cost-effectiveness. (a) Conversion of sludge to oil and gas – Under carefully controlled conditions and extreme temperatures (450 – 1000 degree Celsius), sludge may undergo chemical reactions to produce fuels that may be used for energy production. Processes include gasification, which produces syngas (similar to natural gas), and pyrolysis, which produces bio-oil (similar to diesel oil). There is interest in these as potential alternatives to incineration of sludge. However, operational costs are high, particularly those of maintaining high temperatures, and conditions must be carefully controlled to prevent formation of harmful by-products, such as hydrogen cyanide. (b) Biomass Crops – In some of the European countries, sewage sludge is applied as fertilizer to willow plantations. The trees are periodically coppiced and the wood used for fuel. Research into applying partially-treated, liquid sewage to biomass crops is also underway. Passage of the sewage through the soil acts as a final polishing step for treatment, degrading organic matter, reducing nitrogen and phosphorus and producing a cleaner effluent. Little energy is required and capital and operational costs are low. However, it is not yet known how efficient this system will be at removing pollution and there must be appropriate land available. (c) Hydrogen from Sewage – There is much interest in hydrogen as a fuel, because it can be produced from a wide range of materials and provides power with minimal air pollution. Bacteria use organic matter to produce hydrogen by fermentation. However, applications for hydrogen, such as fuel cells, are not yet in widespread use. (d) Microbial Fuel Cells – These devices offer the possibility of simultaneous sewage treatment and energy production, with water, CO2 and inorganic residue as by-products. Bacteria use organic matter to produce electricity. To date, only lab-scale microbial fuel cells have been developed in some of the developed countries that are able to power small devices. (a) Energy conservation is possible through the twin practices of efficient water use by consumers and efficient energy use by the water industry. (b) There are well-established renewable energy options, such as biogas, and novel technologies, such as gasification, for sewage treatment. Many need further investment and research. (c) Economic and water quality considerations are key drivers for the water industry. Integration of energy related objectives into the existing regulatory framework will be necessary. Anaerobic digestion of wastes provides biogas. Biogas contains about 60% methane that can be used to generate electricity or used for heat or for fuel for vehicles. Any animal manure, human sewage or food waste will produce methane during anaerobic digestion. Natural gas is methane. Biogas can be “cleaned” to yield purified methane that can be used in the natural gas pipelines. Methane from biogas is an excellent alternative energy source. Using methane for energy helps the environment by replacing the use of non-renewable fossil fuels with renewable energy. Methane is a greenhouse gas that has 21 times the heating effect as of carbon dioxide. Biogas methane is renewable unlike natural gas which is mined from underground wells and is a non-renewable fossil fuel. Methane biogas is about to become much more important as an energy source than it has been in the past, due to the ever rising cost of natural gas. (a) Millions of cubic metres of methane in the form of swamp gas or biogas are produced every year by the decomposition of organic matter, both animal and vegetable. (b) It is almost identical to the natural gas pumped out of the ground by the oil companies and used by many of us for heating our houses and cooking our meals. (c) Many countries have for years been steadily building anaerobic digestion facilities for generating electricity from methane produced from manure, sewage and garbage. (d) Villagers in many undeveloped countries use very simple technology to convert animal and human wastes to biogas for cooking and heating. (e) Recently hundreds of farms in India, Mexico and South America have installed anaerobic digesters to collect and use methane from manure to provide energy for farm use. Many of these digesters have been paid for by a company that aggregates and sells carbon credits to factories and utility companies in countries that signed agreements under the Kyoto protocol to reduce greenhouse emissions. Carbon credits are earned by reducing greenhouse gas emissions such as carbon dioxide and methane. These credits have considerable value. (f) In the U.S., which rejected the Kyoto protocol, most of the methane from wastes is allowed to escape into the atmosphere where it contributes to global warming. However there are about a hundred or so dairy farms, a few pig farms, some landfills and a few municipal sewage treatment plants in the U.S. that are collecting methane from waste and using it for fuel. ii) Unbelievable as it may seem, at this time of approaching energy crisis, most farmers can’t get utility companies to purchase their green, renewable electricity. Possible reasons for this reluctance on the part of electrical utilities range from lack of familiarity with connecting farm generators to pressure from coal and oil companies to maintain monopoly of the utility market. Without the ability to sell the excess power generated from methane farmers or others with sources of methane can’t afford to install the equipment for collecting methane and generating power as this usually means an investment of a million or more dollars. iii) This kind of situation needs change. Countries where the production of methane from biogas is not practiced, realizing the seriousness of global warming and problems associated with fossil fuel usage, “green energy” generated from sources such as wind, biomass and, in a few cases, bio-methane are to be encouraged by law. Moreover, consumer pressure will likely be needed to motivate more electric utilities to purchase electricity generated from renewable methane thus ensuring energy security. iv) Biogas from manure or other wastes can be purified to yield pipeline grade methane. With the increase in price of natural gas it has become economically feasible in some cases to remove impurities from the methane and sell it to companies supplying natural gas (methane is chemically the same as natural gas). Due to the energy that must be used to clean, compress and transport the gas this is usually not as efficient a route for using methane as feeding it directly into a generator but, unless electric utility companies become willing to pay a fair price for electricity generated from farm methane, selling gas for pipeline use may become a more common practice. I live in Canada where we use multiple aspect of plasma assisted pyrolysis, to treat sludge and other waste product. A cleaner environment will come from better technologies and more higher density and cleaner source of energy. I was very impressed with the information in your webblog and hope to use some of it in my undergraduate teaching. Is it possible, please, for me to include the diagram of waste water treatment in some online teaching in my university’s virtual learning environment? Our older son is far too impatient to sit in the Epsom salt baths. We finally gave up a switched to a supplement call methylsulfonylmethane (MSM). It is two methyl groups attached to a sulfoxide group and the body will convert it to sulfate if (a big if) the body’s transulfuration pathway is working correctly. It worked great for our son, no more red ears and a significant improvement in his chronic allergic shiners. I found this information to be very insightful yet very disturbing. Considering that the US seems to be sweeping the environmental benefits of biogas under the rug, in return for the money created by existing sources of energy, however detrimental they may be to the enviroment. Its even more frustrating to know that my state of Pennsylvania is currently up in arms about digging hundreds of wells for natural gas (disregarding our beautiful countryside), when cleaner, safer, cheaper energy options are available. Sadly, its already out of the consumers control….’The Man’ has already made the decision to dig, dig, dig to put billions in their pockets. Fuhgetta ’bout us! Please tell me what else sewage water is recycled for. For my high school science homework.